On October 2018 began the selective collection on board in domestic and European flights of Iberia. Specifically, the separation was implemented in 20 daily flights, to be progressively extended to all flights. Periodically characterizations of the waste collected in these flights are carried out to monitor the quality of the separation on board. The first of these characterizations took place in December. 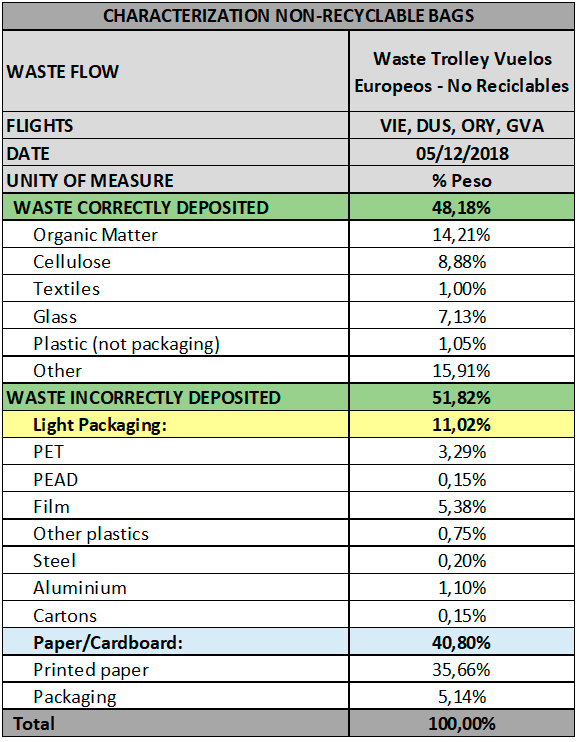 The composition of waste from 5 domestic flights and 4 European flights was analyzed. 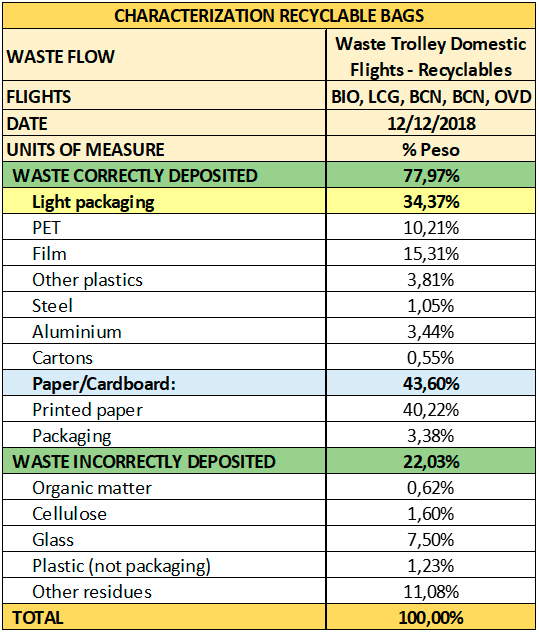 In the recyclable waste bags, 78% of the waste has been correctly deposited, so it was found mainly light packaging and paper, that will be recycled later. In the case of non-recyclable bags, only 34% has been correctly deposited. 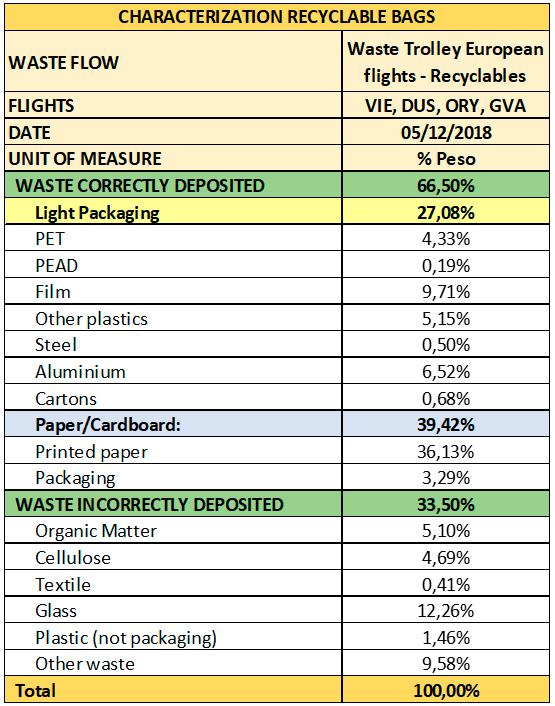 It was observed that frequently, due to the lack of space, in the recyclable bag a lot of press (printed paper, 56%) is deposited in the non-recyclable compartment. 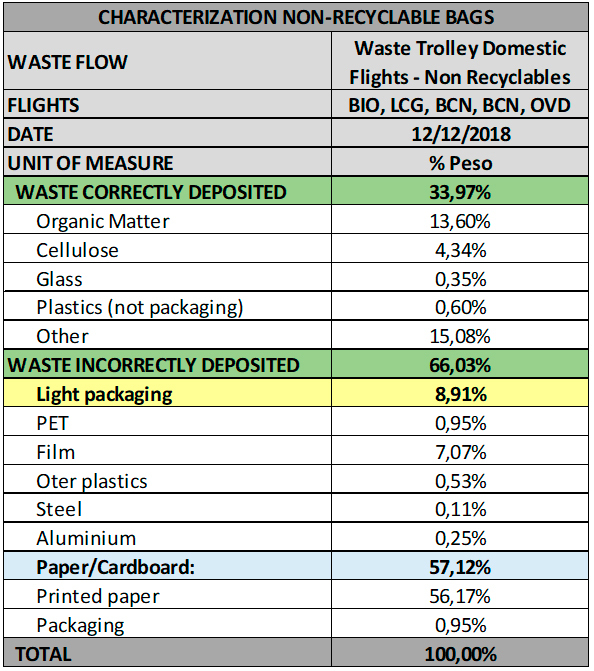 Some measures will be implemented in 2019 to solve this problem: reducing the press on board and improve the identification of the waste on the labels of the trolley. In the recyclable waste bags, 66.5% of the waste has been properly deposited (light packaging and paper-cardboard). The main residue incorrectly deposited was glass (12%). In the non-recyclable bags, 48% of the waste has been correctly deposited. As in the characterization of domestic flights, the presence of press that has been incorrectly deposited in this bag stands out (printed paper, 36%), so there is room for improvement in this regard.